Best 9 Travel Blogs Ever! How many travel blogs are there? Thousands, and some are pretty good. A lot are regular diary type blogs of people travelling or holidaying in exciting and not so exciting places but here are a few of my favourites. They’re all just a bit different and a bit special. Love this blog. Chris gives you 48 hour guides to different cities and places with the emphasis on short 2 days visits. Clear and concise and straight to the point. He makes it sound so easy to get away for a couple of days. The stories of Vicky and Chris from Yorkshire who just love to travel. No showing off and no preaching just enthusiastic stories of where they’ve been and what they’ve seen. I love it. Lots of video on this one from Wendy in Sydney, Australia. It’s packed full of great articles and film of the fabulous coastline around Sydney and the amazing beaches. Great to watch always. Two people. One dream. That’s what the site says and it’s spot on. Lots of interesting stuff here about making money whilst travelling. Even more interesting is that they aren’t backpacking and roughing it, they’re attempting to travel in comfort and some luxury. Great name for a blog. This is all about LeAnne’s world trip. Just started by jetting out to Vegas so worth keeping up with and seeing what she gets up to. Nice blog. Nikki’s adventures all over the world. Featured bloggers, lots of chat about noodles, and a lovely random story telling technique that I really like. The story of Amy and Andrew from the UK and their travels around the globe. They quit their jobs, left their home, and left England a couple of years ago to just travel indefinitely. My sort of couple. It really is one big fat adventure. Another English couple, Simon and Erin left the UK to travel the world forever and they are still going. 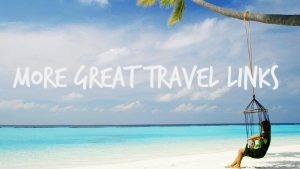 Theirs is more of a professional travel site than other blogs but it’s packed full of interesting articles and stories. Especially interesting is how they fund their lifestyles. Planning their escapes, another couple this time from the US are Wayne and Pat Dunlap. They’ve been travelling for over 3 years ad their site is overflowing with inspiring tales of adventure. It’s very professional looking, I think they’ve been doing this for a while! If it’s inspiration that you’re after just read a few of these blogs and you are bound to get itchy feet. Got a few more here …. Any others I should be mentioning? Look forward to checking out some of these blogs, thanks.